The U.S. Department of Energy (DOE) Systems Biology Knowledgebase (KBase) is a software and data platform designed to help researchers predict and understand biological function. This newsletter contains information about KBase’s newest features, useful links to documentation, upcoming workshops and events, social media pages, and more. Life as we know it depends on the existence of microbial communities (microbiomes), which function collaboratively with each other to extract nutrients and energy from their environment. An upcoming article in the Journal of Cellular Physiology, written by a team of scientists from Argonne National Laboratory (ANL) and Pacific Northwest National Laboratory (PNNL), describes a novel way to model and predict these cross-species metabolic interactions using KBase tools and datasets. In the article, Microbial Community Metabolic Modeling: A Community Data-Driven Network Reconstruction, KBase scientist Christopher Henry and his collaborators demonstrate various strategies for constructing genome-scale metabolic networks that simulate two species in a microbial consortium exchanging metabolites to sustain life. This case study shows the approach's potential for discerning complex microbial community metabolic interactions and behavior. Experimental validation of metabolic simulations that show how one organism can support the growth of others is a powerful technique that can serve energy and environmental missions for DOE and beyond. 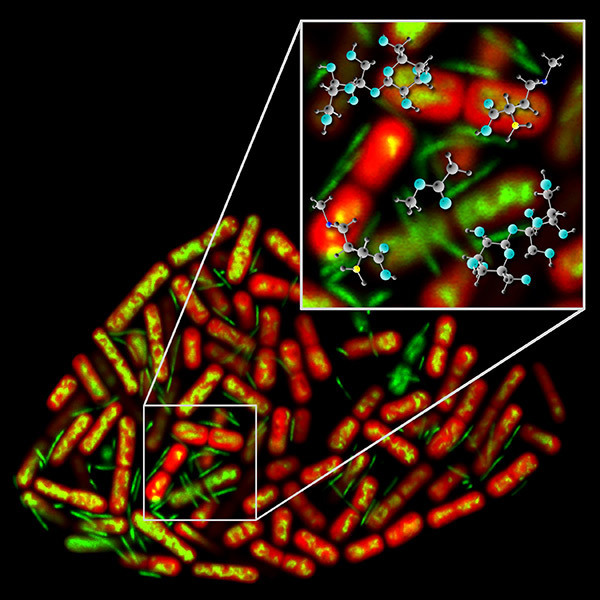 Image: Confocal micrograph depicting a metabolically coupled microbial consortium composed of cyanobacterium Thermosynechococcus elongatus (red) supporting heterotrophic bacterium, Meiothermus ruber (green). Scientists at PNNL and ANL proposed a new approach for microbial community metabolic modeling using this phototroph-heterotroph co-culture as a model system to study how microorganisms living in communities coordinate their metabolisms in response to partnership. Imaged by PNNL scientist, William B. Chrisler. Did you know that KBase has a suite of tools and data that supports the reconstruction, prediction, and design of metabolic networks in individual microbes and microbial communities? In the book, Hydrocarbon and Lipid Microbiology Protocols, KBase scientist José P. Faria and colleagues discuss and compare approaches to modeling the growth and behavior of communities of microbes using KBase. The review describes three approaches (single species interaction, “mixed bag,” and multi-species modeling) to build and analyze metabolic flux models of microbial communities. Explore the Narrative used to create these models at this page. KBase workshops were held at both the Great Lakes Bioenergy Research Center's 2016 Annual Science Meeting and the University of Nebraska, Lincoln in May. The workshops demonstrated how to use KBase’s assembly, annotation, metabolic modeling tools, and data to model single species and communities of organisms and presented examples of recent research performed using these tools to address important biological questions. Other topics included modeling plants and plant-microbe interactions, analyzing expression data using the new RNA-seq pipeline, and the new KBase Software Development Kit. KBase staff hosted a workshop and booth at the American Society for Microbiology's (ASM) Microbe 2016 Conference in Boston in June. The workshop, “Genome-scale Metabolic Modeling of Environmental Isolates and Communities using the DOE Systems Biology Knowledgebase (KBase),” demonstrated scientific use cases and provided participants with hands-on experience using KBase. Booth visitors received personalized demonstrations and help getting started using KBase in their research. KBase scientist Matt DeJongh delivered a keynote address describing his research in creating metabolic modeling software at the 2016 Metabolomics Conference in Dublin in June. Matt’s talk, “Building the Killer App for Modeling Metabolism: from ModelSEED to KBase,” described the development of the RAST genome annotation service, the ModelSEED project for automated reconstruction of metabolic models, and the integration of these tools into the KBase platform. Matt is a professor of computer science at Hope College in Holland, Michigan, and a visiting Fulbright Research Scholar at the Luxembourg Centre for Systems Biomedicine. Learn more about the Apps currently available in KBase by visiting our new App Catalog. You can sort Apps by their functional category (Annotation, Metabolic Modeling), mark your favorites, and view statistics such as how many times each App has been used. You will need to create a KBase account to access the App Catalog and start running your own analyses. We'd love your feedback about KBase! We prioritize future development plans based on user input.